The LCS(L)(3) (Landing Craft Support (Large) Mark 3), often referred to as LCS(L) or LCS, played an important role for the U.S. Navy in the latter part of the Pacific War in the Philippines, Iwo Jima, Okinawa, and other places. 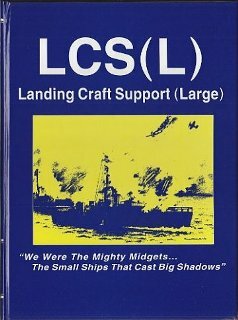 This book edited by four men from the National Association of USS LCS(L) 1-130 presents the overall history of these 130 warships, sometimes referred to as "mighty midgets," along with numerous stories submitted by veterans. The typical LCS(L) had a crew of 6 officers and 75 enlisted men. The ship's primary mission was to provide close-in gunfire support for troops assaulting a contested beach, but during the Battle of Okinawa many LCS(L)s were deployed to radar picket stations set up to protect the main fleet and to detect attacking Japanese aircraft. 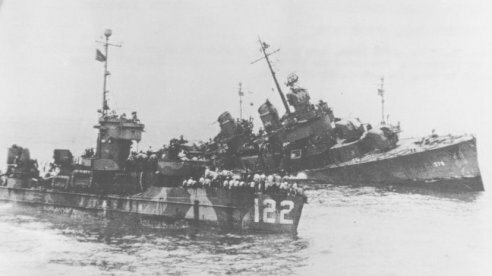 Kamikaze aircraft sank two LCS(L)s near Okinawa, and Japanese suicide boats sank another three LCS(L)s in the Philippines. The book has two main parts with the first 20% summarizing the history of the 130 LCS(L)s and the last 80% consisting of stories submitted by LCS(L) veterans. Both sections include many historical photographs, although some have vague captions. The veterans' stories range widely in quality, length, and approach. They appear in no particular order, but an index allows a reader to find stories related to a particular ship. Some stories, such as "LCS 118: A Radar Picket Patrol" by Earl Blanton (author of Boston——to Jacksonville (41,000 Miles by Sea) about the LCS 118, provide an exciting and concise account of the ship's battles with kamikaze aircraft. Other "stories" are just rather dull diaries of a ship's movements and actions, and many seem to be just telling the official Navy version of a battle rather than providing personal insights. Some veterans submitted a short personal vignette or poem, many which are humorous. The many stories will interest LCS(L) veterans and their families, but two other books, Fighting Amphibs: The LCS(L) in World War II (1997) by Donald Ball and Mighty Midgets At War: The Saga of the LCS(L) Ships from Iwo Jima to Vietnam (2000) by Robin L. Rielly, provide more organized and thorough histories of the LCS(L)s.
The USS LCS(L)(3) 86 officers and men, along with members on the other LCS ships, were the main cast of characters in the greatest sea-air battle in the history of the United States Navy. Yet, little is publicly known about the history or the fate of the LCSs. We didn't have war correspondents on board to report the daily toll taken by the officers and men on the LCSs. They were assigned to the big ships, as though this was where the action was. Consequently, few newspaper or magazine articles were written about the "Mighty Midgets." It is particularly noted that there is no identified newspaper or magazine article that mentions an LCS being hit by bombs or Kamikaze planes. All stories were devoted to destroyers, our dear friends, and the "big boys" - the battleships, carriers and cruisers who we were protecting while on the radar picket station. The Navy's highest award, the Navy Unit Commendation, was awarded to the USS LCS(L)(3) 86 for meritorious service and heroism in action against enemy Japanese aircraft and suicide boats during the Okinawa Operation from April 18 to June 21, 1945. The officers and men of the USS LCS(L)(3) 86 distinguished themselves in battle as well as in peacetime on four occasions: (1) the rescue and damage control given to the USS Braine DD 630 when it was hit by two Kamikaze suicide planes at Okinawa on 27 May 1945, that resulted in 67 being killed and 103 wounded; (2) the rescue and damage control given to the USS William D. Porter DD 579 at Okinawa on 10 June 1945, when it too was hit by a Kamikaze plane and eventually sank without the loss of a single life; (3) the rescue and damage control given to the USS LCS(L)(3) 122 when it was hit by a Kamikaze plane at Okinawa on 11 June 1945, which caused the deaths of 10 enlisted men and one officer as well as 29 wounded and (4) the rescue and damage control given to a Japanese tug and barge when their load of ammunition exploded killing 14 Japanese and injuring nine others on 4 October 1945 in Tokyo Bay, Japan.